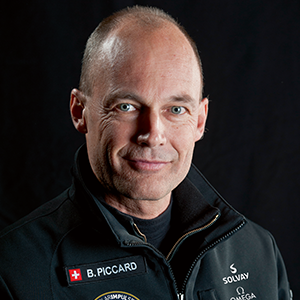 Bertrand Piccard is the initiator behind Solar Impulse, the first airplane to fly around the world without a drop of fuel. He more recently launched the World Alliance for Efficient Solutions, and with it the goal of selecting #1000 solutions that protect the environment in a profitable way to bring them to decision makers by COP24 (2018) and encourage them to adopt more ambitious environmental targets and energy policies. Originating from a family of explorers, it is in his DNA to go beyond the obvious and push back the boundaries of the possible, as he did with his two round-the-world flights – with Solar Impulse and before that non-stop in a balloon. A trained psychiatrist, Bertrand constantly sets out to challenge certitudes and convictions, and advocates for an innovative and pioneering spirit to improve the quality of life on Earth. Envisioning ecology through the lens of profitability, promoting clean and profitable solutions that are “logical” more than just “eco-logical,” Bertrand demonstrates the opportunities that lie in solving climate change. With his dual identities as explorer and medical doctor, he has become an influential voice heard among the most distinguished institutions across the globe as a forward-thinking leader for progress and sustainability.